Those of you who read this blog regularly know that I love my IPhone. It has tremendous capabilities for the outdoorsman. The GPS is on par with $500 stand alone units. If you have cell coverage it is the perfect communication device. My family feels much safer when I have it. The first thing I do when I arrive at a stand is text my Dad my GPS location in case something bad happens. The camera is decent and it can even double as a flashlight in a pinch. The IPhone does have two glaring flaws, however. It is delicate and the battery life stinks. Thankfully I have found two inexpensive accessories to compensate for these inadequacies. 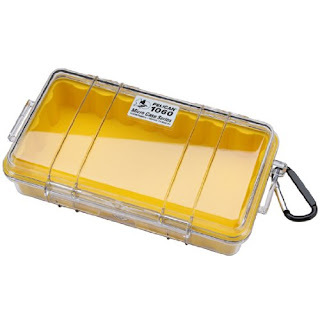 The Pelican 1060 is a watertight box that the IPhone fits perfectly in. Before I bought this case I would leave my IPhone in the truck when I went anywhere wet or rocky. The phone would cost me $700 to replace and is not even a little waterproof or shockproof. Now I put my IPhone in this case, attach the carabiner to my belt, and don't give it another thought. While I was on my fishing trip in the Smokey Mountains I slipped on a rock and fell directly on the case - hard. I fell onto a large domed rock and it hurt! The case barely got a scratch and the IPhone didn't even notice. The manufacturer says this is not for swimming or diving, but I know if you throw it in a stream it will float and not take on even a little water. It retails for $29.99, but you can find it for about $20. If you use the GPS constantly on the IPhone your battery will only last a few hours. It is truly pitiful. I tried to use the IPhone as my sole GPS when I went squirrel hunting last week. That experiment was flirting with disaster. I could actually watch the battery meter shrinking. Thankfully, I have found a portable way to charge it. The Duracell Powerhouse USB Charger is a rechargeable battery pack that will recharge an Iphone once. This effectively gives you twice the run time. You could feasibly use the GPS on your IPhone all day with this. It is light and easy to use. 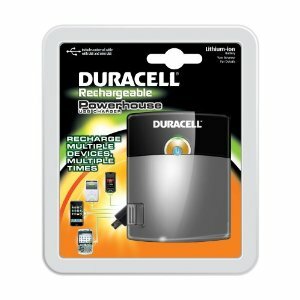 The Duracell Powerhouse retails for $60, but you would be foolish to pay that much for it. It can be easily found for about $20. No one paid me to write about these products. I paid for them myself and actually use them. I do get a small commission if you buy them through the links on this page.